Why Is it Named Idaho? Idunno! Idaho? That’s a mystery. And the most popular explanation is just plain embarrassing. 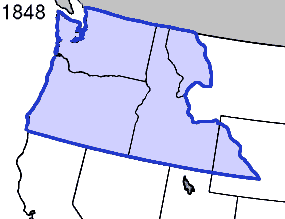 That territory needed a name and Congress went with “Idaho Territory,” borrowing a term that had popped up in the region previous. A Congressional record from 1860 first used the word “Idaho” although without much context. Nevertheless, it fell into use, first, for a steamship in the area and then Idaho Springs, Colorado (1861). Congress used it for Idaho Territory (1863), and then it spread to various other places. But where did it come from in the first place? The Congressional record is silent as to the etymology of the term, but everyone assumed that it was derived from a Native American term. The region pictured above was settled by Americans only a few decades prior; Native Americans, on the other hand, had lived there for centuries. There was only one problem: per the same account, Willings made the name up. “Idaho” doesn’t come from anywhere other than his imagination, and it doesn’t mean anything. While it’s unclear Stoddard’s account is true — Willings had a reputation for being a self-promoter, even at the expense of the truth — there isn’t another credible etymology for Idaho’s name. At best, it’s been lost to history; at worst, it’s the result of a political prankster’s impressive hoax. From the Archives: Why It May Be Okay to Drop Beavers from Airplanes: A story about Idaho.